After college, your biggest expense will be housing. But what about while you’re in college? Housing can still make up a huge percentage of your expenses. Unfortunately, most freshman will be out of luck in the savings department due to universities requiring first-year students to live on campus. But every year after that you have options. In order to save the most money possible and avoid a mountain of student loan debt, you need to think outside of the box. Cutting your housing costs can really help. 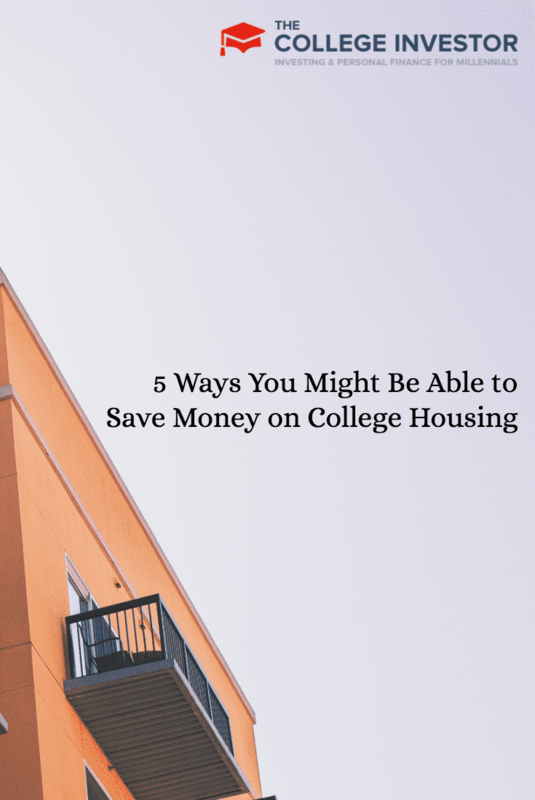 Here are five ways to save on college housing. I know that college is supposed to be the time of your life and you just want to be free. But here’s the thing: living with mom and dad can save you a boatload of cash. Since you’re going through schooling, your parents will probably let you keep your old bedroom rent-free. And even if they do charge you rent, it’s going to be small compared to your other options. The price you pay for a dorm room can vary wildly. For instance, a dorm room in a newer building can be significantly more than a dorm room in an old building farther from your classes. The same goes for occupancy. A private room is going to cost you, but living with a roommate will mitigate your dorm costs. Off-campus housing has many benefits. You are free to find a place that suits your needs and you can split the bill with roommates. Where I live, you can rent a three-bedroom house for around $500 per month. Divide that by three roommates and you’ll be paying a paltry $167 per month. The downside though, is that most financial aid packages won’t cover off-campus living. If you’re receiving financial aid, be sure to check the housing guidelines. A resident assistant (RA) oversees a set of dormitories. In exchange for these services, the RA usually gets their room and board for free. It’s not always easy to get one of these jobs though. You need to keep your grades up, participate in campus activities, and apply to the residence life department at your college. While distance learning isn’t for everyone, it definitely has it perks. You can work at your own pace (kind of) and get an education wherever you have a computer and Internet connection. You can live virtually anywhere when attending college online, making this a good option if you have a knack for online learning. Cutting costs in college is one of the smartest things you can do. It not only reduces the amount of student debt you need to take on, but it also helps you to develop smart money habits right out of the gate. What other ideas do you have for saving on college housing? You can rent a whole house for $500? Wow! That’s a great place to be a freelancer! I paid $460+ utilities in university and that was a pretty good deal.